I like how this ride provides a wide variety of what the Marin Headlands has to offer a mountain biker, packaged into a relatively short ride length. The route takes you over chaparral-covered scenic hillsides, through dense eucalyptus, intersects a Zen retreat, allows a rest stop at a beach, involves a twisty descent with many switchbacks, includes a couple of extended climbs to test your mettle, a fast descent over smooth fire roads that are open to broad views of the ocean, and even incorporates a short stretch over a wide and flat casual trail that's popular with weekend crowds (good for crowd watching). All this while 40% of the ride takes place on trails that can arguably qualify as singletrack, which is impressive given the rarity of bike-legal singletrack in Marin County. It's worth pointing out that the parking lot pointed out as the suggested parking spot for this ride is a very popular one. It's not huge either, so it's very common to find people also parking all along Tennessee Valley Road, on both sides. So, especially if you plan to do this ride on a weekend with good weather, unless you show up really early, be prepared to have to park on the side of the road a quarter mile from the parking lot itself. The ride starts with a sharp climb out of Tennessee Valley on Miwok Trail. The first half mile of the trail is part of what I consider to be the singletrack portion of this ride, though it's a very fresh and (at this writing) relatively wide trail. Along this portion, the grade almost never exceeds 11%. 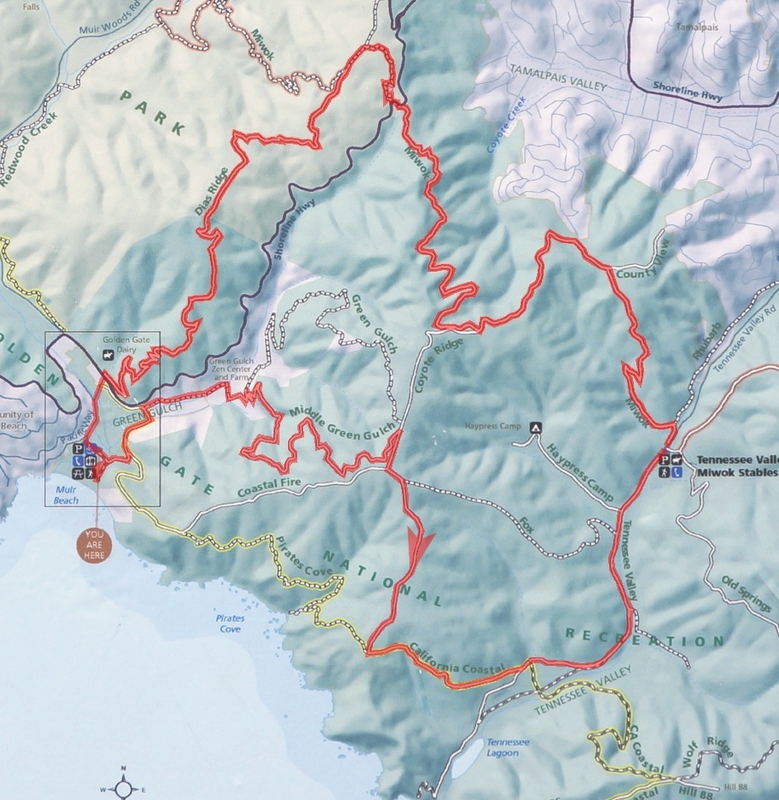 As you get higher, the trail turns into more of a typical fire road as well as getting rockier in some patches, and a bit nastier as the grade wanders above 18% repeatedly over a quarter-mile stretch, as well staying between 20 and 25 percent for one short segment. Once you crest the climb and do a short descent to where you cross a junction, the route dives into a grove of eucalyptus trees. What the trail does under tree cover seems to be no more than a quick descent and a steep climb for no good reason, but things get easier once you emerge on the other end and Miwok Trail starts curving lazily along an open hillside with great views of Richardson Bay and beyond. Miwok Trail mostly stays in the form of a fire road until it reaches Highway 1 where it drops you onto the road for a few dozen feet before picking up on the other side of the road in the form of a narrow singletrack. This short and twisty section of Miwok Trail quickly connects you to Dias Ridge Trail, heading toward Muir Beach. Dias Ridge Trail roughly follows the spine of this ridge while varying in form from a singletrack to a three- to four-foot-wide "multi-use path", all the while without requiring too much pedaling effort. As I write this (in 2013), this trail is another relatively freshly constructed segment of the ride. Therefore, the trail surface is smooth and usually wide in comparison with what most mountain bikers might consider a singletrack. However, it's certainly not a fire road and, given some time, it may weather into a fun strip of dirt. This (roughly) 3-mile trail is the single biggest contributor to the high singletrack percentage of this ride. As you get closer to Muir Beach, pretty views of this small beach as well as its namesake hamlet start opening up just as the trail starts a twisty descent via many switchbacks. While some of these hairpin turns are quite tight, the surface of the trail is never technical. 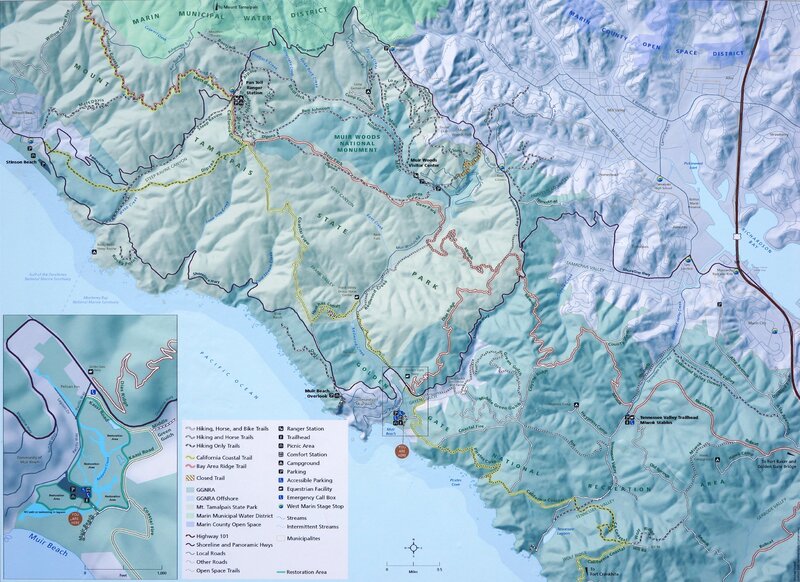 Eventually, it drops you onto a trailhead on Highway 1, from which you pick up the short driveway (Pacific Way) straight across the road, which will take you to the Muir Beach parking lot. After however much time you feel like killing at the beach, you'll continue the ride by pedaling through the Green Gulch organic farm and Zen center. Middle Green Gulch Trail starts right at the "back door" of this farm. You will enter the farm by opening and entering through a (signed) gate. In terms of directions to find your way through the farm to the trail at the other end, all you need to do is continue straight on the main path through this portion of the farm until you see a clear trail sign that prompts you to turn right. What follows is another gate at the beginning of Middle Green Gulch Trail. This trail starts out climbing with some switchbacks. The grade usually tops out around 9%, and so is quite fair. This switchbacking portion of the trail has always been singletrack. It appears that most of the remainder of the climb up this trail has also been transformed into more of a multi-use path in recent years (from what used to be more like a fire road), which I have included in the singletrack total of the ride, though it's not very narrow. (Maybe in a few years...) Right near the end of this climb, the trail finally reverts to a typical fire road after all. Also close to the end of the climb is a segment just over a quarter mile in length where the grade stays above 10% quite consistently and even touches 20% in one tough stretch. So, expect the climb to get a little worse as you get further up. By the way, this trail also happens to be legal only uphill for bikes, so don't get any bail-out ideas back down this trail. Coyote Ridge Trail is the next trail you follow on the ride. As its name might suggest, this trail, too, starts out by tracing right along the spine of a ridge that heads toward the ocean. You follow it through two junctions and soon find yourself descending against a backdrop of ocean views across wide-open expanses of chaparral that are completely devoid of tree cover. This smooth and fast descent is a candidate for the most scenic segment of the entire ride. When you pick up a bike-legal stretch of Coastal Trail (which is indistinguishable in character from Coyote Ridge Trail), you start descending into Tennessee Valley. It will only take you a minute before you complete this fast descent to connect to Tennessee Valley Trail, but don't miss the brief glimpses of Tennessee Beach and its nearby lagoon on your way down. Tennessee Valley Trail is the flat, family-grade, casual trail that I mentioned in the beginning of this text. On nice weekends, this wide path that connects Tennessee Beach to the parking lot from which you started the ride teems with strolling people of all ages, tricycles, picnickers carrying coolers, and all other varieties of "low-intensity trail users". Roughly the last half mile of this last trail on the ride also happens to be paved (though not open to general traffic). If your thoughts, like mine, turn to having a sunny lunch at a nice spot after a Marin ride like this one, you could try a couple of nearby options that I usually use. The option closest at hand will be Dipsea Cafe. This popular eatery has more of a "brunchy" slant, but their menu is big enough that anyone could find something to their liking. Finding a spot in their parking lot (as well as getting in and out) can be a bit challenging on nice weekends, though, and you need to be prepared to have to wait for a table. Your next closest backup options are most likely to be along Miller Avenue, on the way to the heart of Mill Valley, but it would be worth your while to try "downtown" Mill Valley. In addition to bringing together a couple of good options for coffee, the center of this town also features one of my habitual post-ride eateries: The Depot Bookstore & Cafe. It's pretty much what its name implies; a bookstore combined with a cafe that used to be the train depot at which the Mount Tamalpais Railway began. More importantly, it features a sizable menu of good lunch items in addition to a variety of edible and drinkable temptations, and it has numerous outdoor tables looking out at the "town square" and affording a resort-like, laid-back lunch atmosphere.